In the last couple of days, Super Mario Run has received an update that added an “Easy” mode to the game. Why they needed an “Easy” mode for a game that in my opinion is rather easy to begin with is beyond me. However the new difficulty setting wasn’t the only part of the update. Nintendo has made it easier to gather Toads in Toad Rally by way of gaining/losing less of them in the “battle mode” type game. In addition to the new features, the game will be compatible with new events added in the future, such as the golden goomba addition. These goomba will be added to the World Tour mode and thirty bonus coins to your score for killing all of them in each level. This method of collecting things is similar to gathering all of the multi colored coins in each level. Squash every gold goomba in every level and you’ll get your hands on a special building to use for your kingdom in Kingdom Builder. You’ll need to complete the Kingdom Builder tutorial to get gold goomba to appear in World Tour. It will be interesting to see what other classic Mario enemies get added to Super Mario Run. If the Super Mario movie goomba are added, I’ll lose it but they were so big that you would/could only crush one in the level! 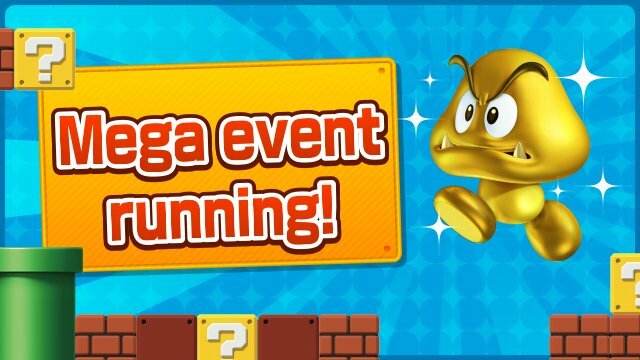 The “Golden Goomba” event runs until February 20th so get going and crush all those gold goomba.